Some of the most common questions submitted to 'Ask Aaron' are about the design of spinning weapons for combat robots. I've edited together Q&A from our archives into a FAQ that should answer the most common inquiries on this topic. More detailed information on weapon design can be found in the archive. Spinning weapons are flywheels. They rely on rotational inertia to collect energy from a continuous power source (electric motor, internal combustion engine...) over time and store it as rotational kinetic energy. On impact, the flywheel releases the stored energy in a blow that far exceeds the energy directly available from the continuous source. Q: How much energy should my spinning weapon store? 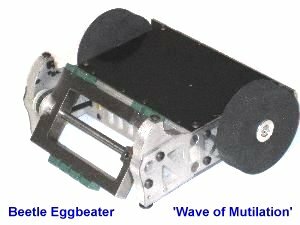 A: Rule-of-thumb: a useful spinning weapon will store at very least 60 joules of energy per kilo of the bot's weightclass. So, a spinning weapon on a robot in the 60 kilo weight class will need to store a minimum of 60 * 60 = 3600 joules of energy. A more typical weapon will store about twice that value. More energy storage is better. Q: How do I calculate the kinetic energy storage capacity of a spinning weapon? A: The Run Amok Spinner Weapon Calculator will calculate the mass, moment of inertia, and stored energy for commonly shaped spinning weapons. It will also graph weapon performance with motors of specific speed and power. Learn to use this tool! Alternately, you can do the calculations by hand. TutorVista.com offers a tutorial on rotational kinetic energy that will get you started. Q: What type of spinning weapon has the best energy storage -- bar, disk, eggbeater or drum? A steel bar 300 mm in length, 75 mm wide, and 23mm thick has a mass of 4 kg. An aluminum disk 300 mm in diameter and 20 mm thick has a mass of 4 kg. A square-frame 'eggbeater' (pictured) 300 mm tall and 300 mm wide made from 20 mm square bar steel has a mass of 4 kg. A hollow aluminum cylinder 300 mm in diameter and 200 mm long with 5mm thick end caps and cylinder wall has a mass of 4 kg. Q: What RPM is best for my spinner weapon? A: It's certainly tempting to spin a weapon up to stupid fast revs. Kinetic energy increases with the square of speed, so if you double the speed you get four times the energy storage. Awesome! The problem is that the faster the weapon spins, the harder it is to get the weapon to 'bite' into your opponent and get a powerful hit. A weapon without bite will just skitter across a smooth surface and do no harm at all. If you have no bite you must rely on your opponent to make the mistake of offering a sharp edge to give your weapon something to grab. How fast is too fast? Section 6.3 in the RioBotz Combat Tutorial has a good explanation of weapon speed and bite, as well as the formulas for calculating bite depth. It's well worth a read. It turns out that the answer depends on the spacing of the impactors and how fast your 'bot moves forward during an attack. You can effectively use greater RPM if you have a single counterweighted impactor and a high rate of closure on your opponent at impact. Decent bite can be very hard to obtain if you have multiple impactors and a timid attack. There is one excuse for a hyper-speed weapon: when two drums/eggbeaters go 'head-to-head' and their weapons meet, the faster weapon wins. If you're building a drum/eggbeater and expect to fight a lot of other similar weapons you might want to keep a few thousand extra RPM in reserve. The rest of the time you're much better off to throttle the weapon back and charge hard. Q: How do I calculate 'bite'? A: Bite is the maximum depth of opponent insertion into the arc of a spinning weapon at a given weapon RPM and forward velocity. You'll get that maximum bite rarely, just like 13 black only comes around rarely on a roulette wheel. Sometimes your luck will be very poor and you'll hit your opponent just as an impactor is facing them and get no bite at all! On average, you'll get half the max bite -- less as your attack speed drops. What's the diffference between a little bite and a lot of bite? More match wins! Bite is good, and more bite is better. Q: Is there a calculator to find the right balance of bite and speed for a spinning weapon? Fighting a hard-surfaced opponent with no sharp edges calls for all the bite you can muster. A drum head-to-head against another drum requires maximum speed and can dispense with bite. Small arenas and close fighting call for big bite, while larger arenas and higher closing speeds need less. When your opponent has only soft exposed surfaces it may be better to ignore 'bite' and switch to sharp 'shred'. If you have a ramp to help your vertical spinner get a shot at your opponent's sharp front under-edge you need very little bite. Stay flexible. Design for ample bite and adequate energy storage, keep some extra RPM available for special cases, and be prepared to throttle back your weapon if it's just 'skittering' across the hard surface of your opponent. Consider swapping in a sharp edge blade for 'soft' opponents. Q: How quickly should my weapon spin-up to speed? A: How much time you have for your spinner to come up to speed depends in large part on the size of the arena. You need to have enough energy stored in your weapon to fend off an opponent who sprints across the arena in an attempt to ram you before your weapon becomes dangerous. In a small arena that doesn't give you much time -- but in a large arena you have an extra couple of beats. It also helps if your robot is nimble enough to dodge a fast ramming attack. Rule-of-thumb: aim to spin your weapon up to at least 45 joules per kilo of the bot's weight class in the first two seconds. Q: What motor do I need to spin up a 4 kg disk to 2000 RPM? How quickly you want the disc to reach 2000 RPM. The power to sustain the disc at 2000 RPM is negligable, so it all comes down to how quickly you want your disc to reach the required speed and energy storage level. A larger diameter disc will take longer to spin up to speed than a smaller disc of the same mass, but it will store more energy for greater impact. An aluminum disc 300 mm in diameter and 20 mm thick weighs 4 kg. It will store about 970 joules of rotational energy at 2000 RPM. A 'Small Johnson' motor with 0.56 N-m stall torque and a no-load 24,000 RPM speed geared down 12:1 will spin this disc up to 1300 RPM (420 joules) in about 1.4 seconds and will approach 2000 RPM (970 joules) in about 4.3 seconds. Not bad. An aluminum disc 600 mm in diameter and 5 mm thick also weighs 4 kg. It will store about 3850 joules of rotational energy at 2000 RPM. That same 'Small Johnson' motor geared down 12:1 will spin this disc up to 1300 RPM (1700 joules) in about 5.8 seconds and will approach 2000 RPM (3850 joules) in about 17.3 seconds. That's too long to wait for spin-up. A more powerful Ampflow E30-150 motor with 5.0 N-m stall torque and a no-load 5700 RPM speed geared down 5.7:1 will spin this disc up to 1300 RPM (1700 joules) in about 2.7 seconds and will reach 2000 RPM (3850 joules) in about 8.2 seconds. A bit slow for some arenas, but a good balance between spin-up time and energy storage. Q: I want to use a brushless motor for my spinner weapon. How do I calculate the 'Stall Torque' of a brushless motor to enter into the on-line Spinner Weapon Kinetic Energy Calculator? The estimate is useful for weapon spin-up calculations, but a brushless motor torque curve is non-linear and 'stall' torque is not the torque peak as it is in brushed motors. Use of this torque estimate for drivetrain calculations is questionable. * Note: the estimator's 20% 'soft start' penalty value is typical for applications using unsensored brushless controllers. A more comprehensive and accurate model of 'soft start' spinner weapon performance is available from the Team Run Amok Brushless Spinner Excel Spreadsheet. Q: I know any robot with a spinning weapon is subject to gyroscopic forces, but how does this differ for vertical and horizontal spinners? A: Any time you apply a force to change the direction that the axis of a spinning mass is pointing, gyroscopic resistance will attempt to redirect that force at a right angle. This may have undesireable effects on robot mobility. A vertical spinner (diagram at right) must deal with this force redirection every time it turns. A quick pivot with the weapon at full speed results in a 'gyro dance' where one wheel lifts off the arena surface. The dance may be impressive, but it reduces maneuverability and pulls the weapon out of effective attack position. The spin axis of a horizontal spinner points straight up so does not change orientation when the robot moves or turns; it will not suffer from gyroscopic wheel lift. In order to 'dance' a horizontal spinner must be tilted from a reaction to a hit by its own weapon, from an opponent attack, or from instability in the weapon design. Q: I've seen vertical spinner 'bots that looked very similar to each other but one had HUGE problems with gyroscopic forces and one didn't. How do I make sure my design isn't going to have trouble? Q: How tall should the impact teeth on my drum (or disk) spinner be? The 'Attack Speed' is the closing rate between your robot and your target and it's target. Given that attacks with both robots charging directly toward each other at full speed are uncommon, the value is usually assumed to be your own robot's top speed. In small arenas with cautious competitors the attack speed may be considerably less. Best judgement applies here. Example: a robot with a top speed of 5 MPH (88 inches per second) has a weapon with two impact teeth spinning at 5300 RPM. A more complete explanation of tooth height and 'bite' is featured in section Section 6.3 of the RioBotz Combat Tutorial. Q: My robot design calls for a drum weapon 15 cm long with a weight of 7 kg. What drum diameter and wall thickness will store maximum energy? 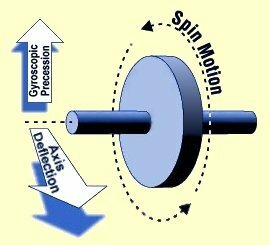 A: Spend some time studying up on flywheel physics. It's more than I can cover here, but essentially: the farther mass is placed from the axis of rotation, the greater the rotational energy storage an object will have. The variables that determine the energy that a spinning drum holds at a given RPM are: mass, material density, diameter, and length. Given those variables you can calculate the required wall thickness. You've specified mass and length, and I'll assume that you're using steel. Holding mass, length, and speed constant the rotational energy storage will increase with increasing diameter. If your primary design consideration is greatest energy storage, make the drum as large in diameter as is practical for your overall design. Q: I want to build a drum weapon that stores 5000 joules of energy at 5000 RPM. Mass is limited to 13 kg and diameter cannot exceed 15 cm. What should be the drum's diameter and wall thickness? A steel cylinder 15 cm in diameter 100 mm in length, and solid to the center will weigh 11.5 kilos and will store 5000 joules of energy at 5000 RPM. A steel cylinder 15 cm in diameter 300 mm in length, with a 6.7 mm thick wall will weigh 7.1 kilos and will store 5000 joules of energy at 5000 RPM. An aluminum cylinder 15 cm in diameter 300 mm in length, with a 31 mm thick wall will weigh 9.6 kilos and will store 5000 joules at 5000 RPM. An aluminum cylinder 15 cm in diameter 2600 mm in length, with a 2 mm thick wall will weigh 6.7 kilos and will store 5000 joules at 5000 RPM. A steel cylinder 15 cm in diameter 380 mm in length, with a 10 mm thick wall will weigh 13 kilos and will store 5000 joules at 3760 RPM. A steel cylinder 20 cm in diameter 390 mm in length, with a 7 mm thick wall will weigh 13 kilos and will store 5000 joules of energy at 2780 RPM. A steel cylinder 25 cm in diameter 360 mm in length, with a 6 mm thick wall will weigh 13 kilos and will store 5000 joules of energy at 2175 RPM. Don't compromise weapon performance with dimensional restrictions that you can avoid, and design for the lowest weapon speed that will store enough energy to be effective. The weapon may be the least important system on a combat robot. If you're not winning matches it isn't because you have a poor weapon. Drivetrain, radio set-up, general construction practice, and weapon/chassis balance are all much more important than the type of weapon you choose. There are plenty of examples of winning robots with ineffective weapons, and there are many more examples of losing robots with awesome weaponry. If you get the basics right you're going to have an above average robot no matter what weapon it carries. Copyright 2015 by Mark Joerger -- all rights reserved.